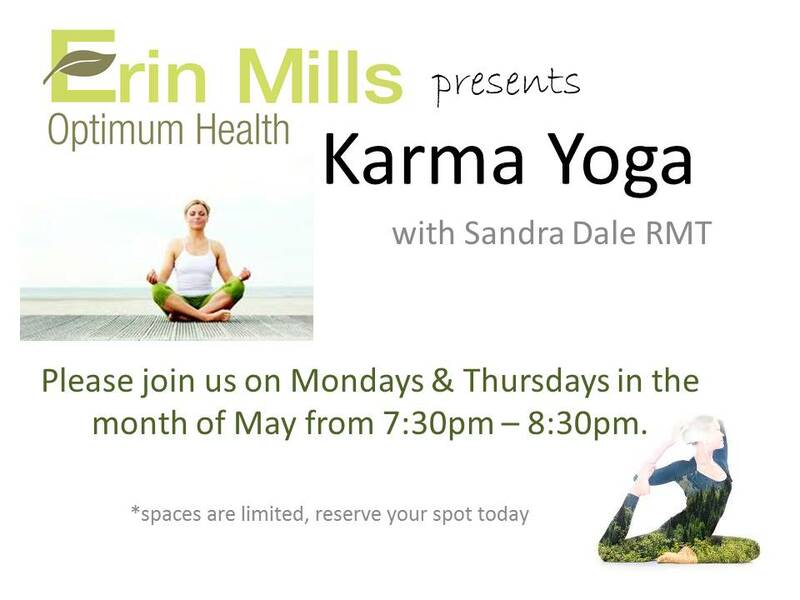 Our Mississauga RMT Sandra Dale is doing Karma Yoga at our Mississauga Wellness Office through the month of May 2017 from 7:30 – 8:30 pm on Mondays and Thursdays. Sandra is an excellent massage therapist who has a passion for life and learning. Yoga is her current learning passion and she is excited to share it with our Erin Mills Optimum Health community in Mississauga. Read more about Sandra Dale RMT. To reserve your spot for these limited spaced Karma Yoga sessions, contact the front desk today! Karma Yoga is a way that a student of yoga gives back to the community in goodwill. Our registered massage therapist Sandra Dale is studying yoga and is doing these karma yoga classes for our patients and community as part of her learning and giving back. Is Yoga good for me? Yoga is an excellent way to work towards your optimum health. Yoga is great at helping your connect your brain to your body and to practice appreciation and presence. Improve your mindset with yoga! Yoga is a great way to improve your balance! Balance is an overall sign at how well your brain and body connection is. Check your balance now by standing on one leg! How long can you stand there? If you can’t stand still for more than 5 seconds, you need to improve your balance before you stumble and fall! Yoga is an excellent way to practice your breathing! Even though we breathe all day (apparently), people and patients are often seen breathing improperly! Be careful with some of the motions in yoga as they can be difficult for your spine. Usually our Chiropractors advise that you should not compete against other people during the karma yoga sessions as you need to be cognisant of your own spine and abilities. By pushing your flexibility too far, you are more likely to create an unstable lower back and aggravate your discs in your spine as opposed to improve your spinal health. Core stabilization is an important aspect of optimum health. Yoga is an excellent way to improve your core strength! Sandra first became interested in alternative health care after receiving a reflexology treatment. Since then she has followed a path of wellness that has led to becoming certified in Reflexology, Aromatherapy and Massage Therapy. 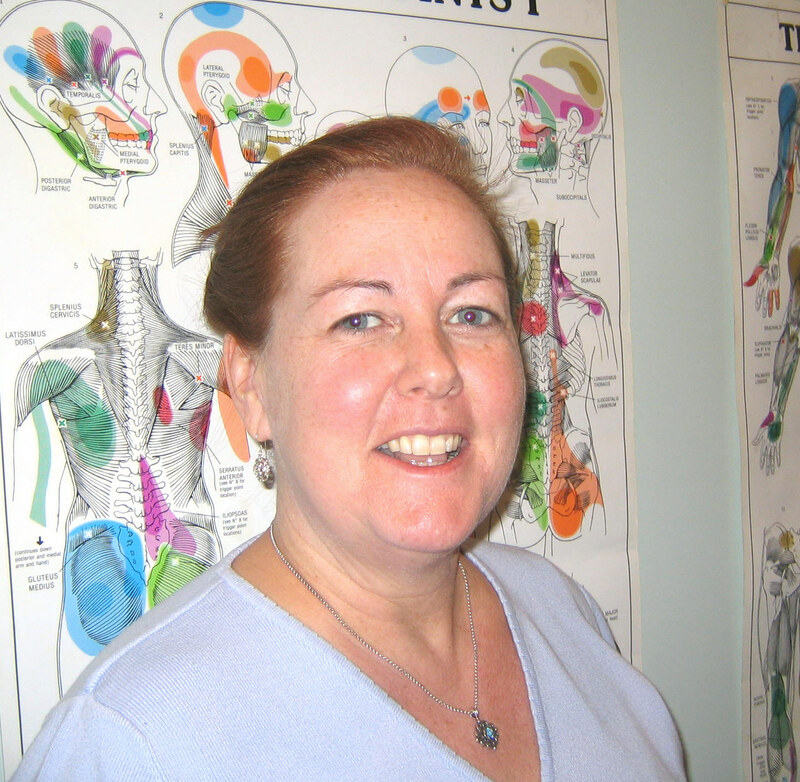 Graduating from Kikkawa College in 1995, Sandra has worked in a variety of clinical settings such as, motor vehicle accident and WSIB rehabilitation centres, chiropractic offices, multi-disciplinary health centres, spa settings, as well as a corporate massage setting. She has taught massage therapy in a night school setting. She also has trained employees of Air Canada and Brewer’s Retail in a BACK SAFE program. Sandra enjoys working with the whole community, from babies to seniors, offering them her knowledge and years of experience at hand. Her interests over the years have been additional studying in Thai massage, Ayurvedic massage and Hot Stone massage. She also has an interest in Lomi Lomi (Hawaiian massage). Sandra is a mother of two daughters and has lived in Mississauga most of her life. Her enjoyments include travel, tennis and dance. She is a certified ZUMBA instructor which combines Latin dance and exercise fitness. Her next venture is to study Yoga.